Imagine looking at a picture of a brightly colored frog. Put on your color filter science goggles, and the frog is gone! Imagine writing a message that can only be read with your special science goggles. Now imagine your classroom—20 goggled faces looking around the room in wonder. “It’s gone! It disappeared!” “The flowers on my shirt turned to little black spots!” “Your stripes disappeared!” “Weird … this pencil turned all white!” These are only a few of the amazed exclamations we heard as we began our 10-day unit on color and light filtration. We continued to hear such enthralled remarks throughout our unit, and the WOW factor never diminished. Our main objective for the experience was not to delve too deeply into the physics behind light wavelengths but rather to provide students an opportunity to build a science tool, use it to investigate a topic, and then apply their knowledge to produce a book to share with others. This unit achieved all that. Studying color filtration, students literally investigated everything they “saw” in their classroom. As they worked with the goggles, students sharpened their observation skills, learned some basics about light and color, and discovered firsthand that science knowledge can be used and applied to other subjects. Wars are fought over it. The price of it can stir fear, even despair, among us. Energy. Energy drives our universe. Our use of certain types of energy sources may even be destroying our planet. Energy is a difficult topic to conceptualize but students can contemplate and generalize about energy. We live with a dizzying array of electronic devices—cell phones, mp3 players, and DVD players to name a few. Students can operate them with amazing ease, but what do they really know about the basic science concepts used in these technologies? After asking some questions to our fifth-grade classes, we discovered that most students know that electronic devices like cell phones use electrical energy from a battery to produce sound energy through a speaker. However, when we asked them to explain how exactly a speaker makes sound there was a deafening silence! No one had a clue. That was our cue to develop this high-impact activity in which students build, test, and improve their own “coffee can” speakers to observe firsthand how loudspeakers work to convert electrical energy to sound. The activity is appropriate for students in grades three to six and lends itself best to students accustomed to working in groups and who have already done some hands-on investigations with electricity, magnetism, and sound. The basic elements of inquiry include: ask a question, conduct an investigation, make observations and collect data, use data to develop an explanation, and communicate results. The 5E learning cycle model is very useful for designing lessons that include the above inquiry abilities. The learning cycle includes five phases, an engage that focuses students on a question, an explore where that question is investigated, an explain where the data from the investigation are analyzed and interpreted, an extend and apply where concepts are connected to other concepts as well as to the real world, and finally, an evaluate where the understandings are assessed. This article describes how to “inquirize” a demonstration activity with steps that can be applied to any activity. From the youngest ages children construct buildings, bridges, towers, and anything else that comes to mind using a variety of materials. This month’s books and activities take this interest in construction and build on it by allowing students to experiment with structures, their design, and how they withstand forces. Through building activities young students start to develop science concepts associated with engineering and technology, while older students are able to put their knowledge of structures to the test in the design process. Maria lifts up a book from the table. Dietre eats cereal for breakfast. Akisha winds up a toy robot. Jacob puts batteries in a flashlight. 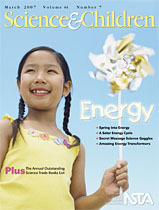 These seemingly dissimilar events demonstrate various ways children experience energy daily. You can help primary students make sense of these experiences and build their conceptual understanding of energy with this series of hands-on energy activities. We’ve used these lessons successfully for several years and have been continually impressed with the understandings that students develop as they conduct them. The lessons focus primarily on elastic, or spring, energy and use a conceptual hook, a simple phrase that identifies the key ideas from the activities. In these lessons, the “hook” is “lift, squeeze, stretch, and twist,” which summarizes some of the ways students can “put” energy in objects. We chose to emphasize spring energy because it is tangible—students can easily observe the spring (or similar objects such as a rubber band) change as they squeeze, stretch, or twist it, and they can feel the spring resist them as they change its shape. In sixth grade, students understand that Earth gets visible light from the Sun, but students may also believe the Earth gets heat from the Sun. This last part is incorrect because the Sun is too far from the Earth to heat it directly. So, how does the Sun heat the Earth? When light strikes an object, it can be reflected or absorbed. Absorbed light usually increases the energy in an object, which causes the object to heat up. The following solar energy learning cycle (Exploration, Term Introduction, and Concept Application) was developed to help sixth-grade students better understand the concept. This learning cycle also facilitates technology integration and provides students opportunities to construct and generate experiments with scientifically testable questions. The cycle takes six 50-minute periods. Often the word assessment conjures up the notion of tests or quizzes that occur at the end of a lesson or a unit. These summative assessments take place when an instructional sequence is completed, providing a summary of what students learned. The summative information reports a student’s status for purposes of grading, evaluation, or certification. Although results may be provided to parents, school districts, and other external agencies, these results typically have minimal bearing on classroom instruction and student learning. In contrast, formative assessment is used to gain information that improves instruction and advances student learning. Just as a doctor diagnoses symptoms before determining how to alleviate them, a teacher must diagnose student ideas before determining how to help students learn scientific ideas (Osborne and Freyberg 1985). From eye-catching introductions to planets, animals, food, and the senses for the very young, to little-known aspects of dinosaurs, to the importance of food chains, these recently published books in Spanish are sure to engage and inform young Spanish speaking scientists-to-be. Tentative grade levels have been indicated for each book, though the individual student’s Spanish reading ability, interest, and purpose should be the main criteria for determining the true level of each book. Understanding the connection between the Sun’s energy and sustaining life is difficult for preschoolers, but learning about these concepts through both long and short-term activities captures children’s short attention spans. Activities such as growing plants in sunlight and without light, playing with light and shadow, and making “sun prints” explore light—in this case how the Sun’s light is different from lamplight. Children experience forces at work while on the playground, in gymnasiums, and in toy stores. Scooters, baseball bats, basketballs, and jump ropes all need pushes or pulls to make them move. When objects change shape as they are pushed or pulled, we say they deform. If the object returns to its original shape when the force is removed, we describe the material as elastic. A rubber band, a balloon, and a spring are all elastic. Objects that remain distorted, such as modeling clay, are often categorized as plastic. Wherever there is motion, energy is always involved. What causes objects to move? This month’s Science Shorts helps students explore the concepts relating to force and motion. Apples and oranges… and lychees and loquats—how can one compare? That’s the challenge when a team of NSTA’s best science educators attempt to select the best of each year’s science trade books. It’s been 34 years since NSTA joined forces with the Children’s Book Council to select the best trade books each year. Publishers submit hundreds of books for evaluation, and the judges have a daunting task. First, they need to determine if the books are truly “trade books” that would normally be found in a bookstore, and they must always represent the best of the National Science Education Standards. Science 101: What exactly is energy? It isn’t an easy task to explain what energy is. For that simple answer, let’s head to your average science textbook and retrieve the following: “Energy is the ability to do work.” Okay, but what does that mean? What do we mean by work? Even if we know what work is, does that give us a good feel for what energy is? Is energy something tangible, like a rock? Can you hold energy in your hand? Is energy something we can model in the same way we draw models of atoms or representations of magnetic field lines? This article attempts to answer some of these questions.